A favorite for couples choosing St. Louis for their honeymoon destination, this richly appointed suite inspires intimate relaxation in spacious style. 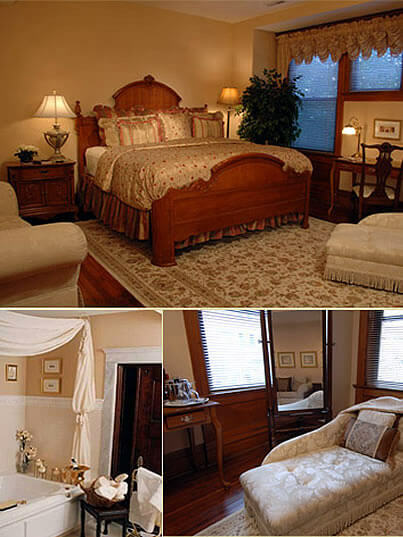 You’ll be irresistibly drawn to the king-sized Victorian Mansion Bed, opulently piled with down pillows and comforters. An adjoining bath boasts a Jacuzzi tub for two and a separate shower. The scale of this room makes it ideal for pre-wedding preparations! Tower Grove Park is also our signature honeymoon suite. When you choose The Tower Grove Park Room, why not visit the namesake park, just .5 miles from our bed and breakfast? Or go for a magnificent carriage ride? Dotted with hotel ruins; a beautiful pond with its water lilies, designed for model sailboats; pavilions; 1800s statues; and a greenhouse, the municipal park’s 289 acres inspire leisurely walks, group gatherings, and photographers alike. Be on the lookout for William Shakespeare, Christopher Columbus, naturalist Alexander von Humboldt, Mozart, Rossini, Beethoven, Wagner and Verdi: just a few of the iconic faces preserved in the park’s statuary.